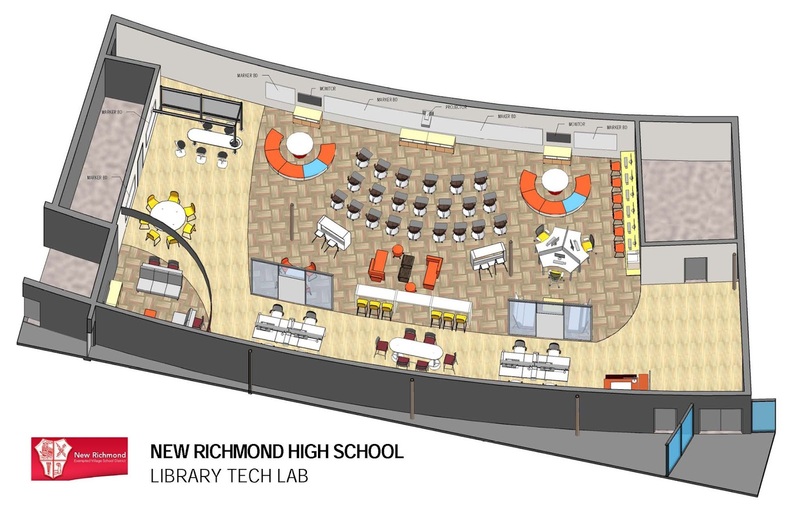 The New Richmond Board of Education decided a decade ago not to build a new high school and began the process of bringing the New Richmond High School building up to modern standards. First came the replacement of the façade and structure repairs; then came removal of asbestos and replacing ceilings and floors; and most recently adding energy efficient lighting, heating and air conditioning. But something was missing inside the modernized high school building. The library remained ‘Your father’s library,’ not the modern equivalent of learning centers which have become the social, collaborative hub of the campus while maintaining their role as places for intense study. “We had a classic library which was using original furniture when the building was built in 1965,” noted NREVSD Supt. Adam Bird. The 1965 library experience wasn’t going over very well with recent graduates who went on to college. That all changed this summer when, with the backing of the Board of Education, Mr. Bird and Mr. Bailey presented returning high school students with a contemporary, $200,000 learning center that provides private study space while at the same time supporting multiple large and small group meetings. College and Career Success Class. "We want our students to be inspired to learn and we were looking for a more collegiate and contemporary look for our new media center," said Bird. Seating options include booths, mobile chairs, bar stools, ottoman seating and open cubicles. An example of the media center’s flexibility is the College and Career Success class taught by seven business leaders from the Clermont County Chamber of Commerce. The course focuses on helping senior students learn the skills necessary to aid in the smooth transition from high school into the workplace or college life and the Chamber group is able to go from one large group to seven individual groups in a matter of seconds. “If you have a class and you want students to work in pairs or in groups of four, it’s very easy to maneuver to change the academic focus to allow students to something a little bit different from the classroom,” said Bailey. of the College and Career Success class. The media center has been a big hit with teachers and students alike. Booth seating areas are perfect for 4 to 6 group meeting. Lee Rose – Admissions Counselor for Chatfield College is pictured with her small group during the College and Career Success class.